Have you read the in-game news headlines and laughed? Thought you could do better? 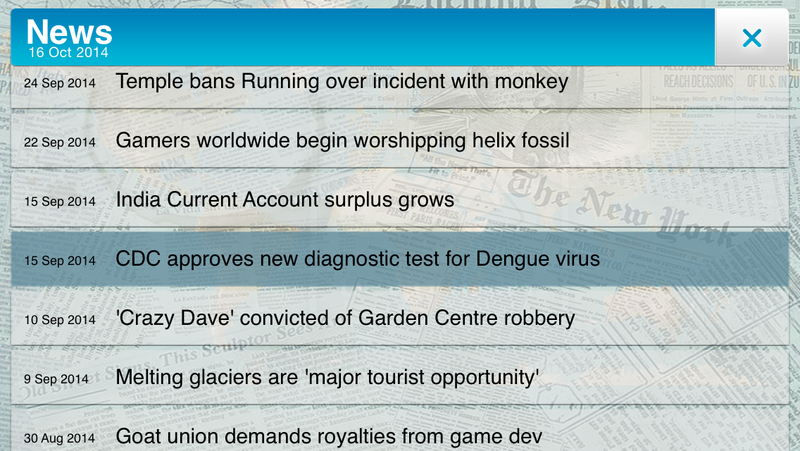 Well now you can write a news headline, and have it featured in Plague Inc. on mobile and PC, to be read by over 25 million people worldwide! One of the things we get asked about most is the inspiration for our dynamic, in-game news headlines – over the last two years, the world of Plague Inc. has seen everything from a Harry Potter reboot, Justin Bibble being trampled, the launch of Kickstopper and Blankbook, revelations on the speed of Valve Time, and most recently the rise of a Helix Fossil… What should we add next? If you’re looking for ideas – why not look at anything in the news recently? Are there any other games you’d like to reference? What’s popular and topical online? What would make players laugh? You can try anything you want – just make sure it’s clever, witty and no longer than 50 characters! Post your proposed news articles in this thread – you’ve got until 16th May 2014, so get writing! -	No use of profanities or adult content please! CDC claims "It's not Lupus, it will never be Lupus"
Couple gets married through virtual reality. Pizza-flavored beer released in Italy. UK gives Gibraltar back to Spain. You need to edit the last rule that we can get compensated for reaching Reddit's front page. Disease Inc soon compatible with Oculus Rift ! Malaysian Airplane lost on time-traveling island. Women kidnapped by man with police box. 'Obesity linked to eating,' claims WHO. -New green crystal discovered near Tiber river. -Modern bald Prophet claims to be immortal. -New 'Death Ray' satellite built by the U.N.
-New 'Brotherhood' cult influence grows. -China to adopt English as official language. -UK to abolish Royal Family. -Confirmed: Mars colonised by Druid astronauts in 1700 BC. -Eiffel Tower to be dismantled. -Language pills for instant learning invented. -Grow your own 'instant fresh pasta' on trees. -Astrophysicists confirm the existence of White holes. -'Mind Reading' Google search mechanism introduced to the market. -Penguins learn to fly, zoologists baffled. -North Korea rejoins the Nuclear Nonproliferation Treaty. -3D printed heart successfully transplanted into human patient. -Clones march on Washington : Demand equal rights. -Polio eradicated, people worldwide celebrate this day. -There is now a cure for male pattern baldness. -Man is aged 150 but looks 20, 'doctors hate him'. -First Thorium Molten Salt Reactor operational in the U.S.
-The U.S finally adopts the metric system. Flying Spaghetti Monster will return, Pastafarians claim. NASA films Russell's Teapot, apparently bigger than it seems. Fan death caused hypoxia to 13 people, fan currently in court. Newton's hair, a new haircut trend around the world. Scientists finally discover why cats act as liquids. Yellow man admits to consume ghosts, reason unknown. "The Internet is your only friend," global activist group claims. A strange blue solid substance discovered in New Mexico. US president : "We've got 99 problems but China ain't one". Tchernobyl became one of the most visited place in the world. Lack of global productivity due to the expansion of mobile games. "This new disease is too mainstram", say hipsters. A megalomaniac want to build a parc with real dinosaurs. World record of drunk people in a music festival in Germany. 1: Tchernobyl became one of the most visited place in the world. 2: "This new disease is too mainstram", say hipsters. 3: World record of drunk people in a music festival in Germany. Current time: 21-04-2019, 05:45 PM Powered By MyBB, © 2002-2019 MyBB Group. Theme created by Justin S.